Unions are preparing to vote on strike action but would need to give Gatwick at least seven days notice before any walk out. People planning holidays from Gatwick Airport in the run up to Christmas could face travel chaos as unions threaten to strike over a pension dispute. Workers are preparing to vote on whether to take industrial action in response to a decision by the company that owns Gatwick - Global Infrastructure Partners (GIP) - to close the final salary pension scheme because of a reported £90 million shortfall. Earlier this year, Gatwick announced a 77% rise in pre-tax profits to £141 million. Firefighters, maintenance staff and security crew are among the workers that will vote on strike action proposals. A spokesperson for Unite says its members are "understandably angry". "Gatwick is highly profitable and we believe rather than closing the scheme, steps can be made to make up the modest shortfall in the scheme," the spokesperson said. Unions are legally required to give Gatwick at least seven days notice before any walk out. Unions have held talks but claim GIP refused to discuss ways of bridging the funding gap. One Gatwick security worker said: "They are trying to bulldoze it through even though they've just announced record profits. If there is no fire service it could shut down the whole airport." 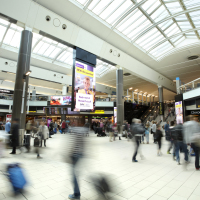 A spokesperson for Gatwick said: "Gatwick Airport, like any business, will regularly monitor reward packages to ensure that they remain competitive and to safeguard the long-term future for our employees, passengers and local community. "We fully appreciate that pensions are a personal and sensitive topic and it goes without saying that we are taking this forward in a collaborative manner. We will continue to engage, consult and collect the views of employees and encourage members of the defined benefits plan to use the consultation process to air views, understand the issues facing the scheme and ask questions." The south east London airport is currently competing with Heathrow for approval for a new runway, with a decision expected this month. With a capacity for 45 million passengers each year, Gatwick Airport Gatwick currently handles just 42 million. Travellers with flights booked over the Christmas period should make sure they take out travel insurance so they are protected against flight delays and cancellations.